The ELCA members of the Lutheran-Orthodox Dialogue are willing to set aside, at least in certain respects, the version of the Creed that they have always used, but at the same time they wish to retain the pneumatological theology that this version of the Creed embraces and reflects. What are we to make of this? And as Andreae and his colleagues note further, the Creed adopted at Constantinople states that the Spirit proceeds from the Father, but it does not teach that He proceeds from the Father alone.10 In other words, the absence of the Filioque is not necessarily a denial of the Filioque, just as the absence in both versions of the Creed of explicit references to many other important articles of faith, such as original sin or the real presence of Christs body and blood in the Lords Supper, is not a denial of those doctrines. The ancient Greek and Latin Fathers certainly acknowledged each other as brethren, with whom the blessings of church fellowship were enjoyed. However, because of their linguistic differences these Fathers frequently used different words and concepts in their theological writing. This was not perceived as a major problem, since the differences in terminology did not reflect differences in doctrine. The ancient Fathers understood that the same Biblical truth can be stated in a variety of ways, just as Lutherans recognize the Augsburg Confession and the Smalcald Articles as mutually-compatible expressions of the same faith, despite the marked differences in style and vocabulary between Philip Melanchthon and Martin Luther. By comparison, the Greek Fathers did not categorize the concept of procession from into two senses. Instead, they taught that the Holy Spirit eternally proceeds from the Father, with a meaning that is comparable to the Latin understanding of proceeds from in the proper and principal sense. In describing the eternal relationship of the Spirit to the Son they used different terminology altogether, stating that the Holy Spirit eternally proceeds through the Son, or that he eternally receives from the Son, and similar expressions. The Greek Fathers certainly believed that the Spirit is from the same essence of the Father and the Son, but they were hesitant to say that the Spirit proceeds from the Son. In their theological vocabulary that phrase was reserved to describe the eternal relationship of the Spirit to the Father, who, as the eternal source of the Godhead, is the ultimate source of the Holy Spirit. In their careful use of this distinct and precise terminology, they hoped to preserve the churchs understanding of the distinct internal operations of each of the Divine Persons as taught in Holy Scripture. And especially in their teaching on the eternal emission of the Holy Spirit, they wanted it to be clearly understood that the primacy of the emission returns to the Father. The version of the Nicene Creed that was adopted at Constantinople confesses, in effect, that the Holy Spirit properly and principally proceeds from the Father. The Latin Church, at a later time, added to the Creed a confession of the Spirits procession from the Son (in a secondary and derivative sense), while the Greek Church never made such an addition. If it had, it almost definitely would not have followed the distinctive Latin approach, for the reasons given above. According to Chemnitz and Andreae (who studied this subject more intensely than most Lutheran theologians have done), the intended meaning of the classic Greek terminology was essentially the same as the intended meaning of the classic Latin terminology. It was therefore not necessary for Christians in the Greek tradition to say, in so many words, that the Holy Spirit proceeds from the Son, since the terms that they did use to describe this relationship conveyed the same thought. But this ancient patristic consensus on the procession of the Holy Spirit, which the Lutheran Concordists recognized, began to be obscured in the eighth and ninth centuries. The overall relationship between East and West had started to sour, due largely to the Popes increasingly vocal claims to universal authority and jurisdiction over the entire church. In this climate of strained relations and mutual suspicions, the differences in theological vocabulary that had always existed between the two traditions, in reference to the intra-Trinitarian relationships, began to be portrayed by the more contentious elements on each side as evidence of real doctrinal differences. The Eastern Church was also offended by what it perceived as the unfraternal presumptuousness of those segments of the Western Church that had altered the official conciliar text of the Nicene Creed without its concurrence. The Greeks were especially displeased by the active efforts of Carolingian theologians and missionaries to promote and disseminate the altered version of the Creed, with the Filioque addition. According to Chemnitz, This division was healed at the Council of Florence36 which met from 1438 to 1445. This was a union council, with participants from the Latin and Greek Churches. Its aim was to heal the breach between Eastern and Western Christendom by reaching agreement on four divisive issues: papal primacy, the form of bread to be used in the Eucharist (leavened or unleavened), purgatory, and the Filioque.37 From the Latin side, the Pope was prompted toward this effort in part by the fear that the conciliarists, who believed in a limited papacy, might attempt to achieve union with the Byzantines on their own terms, without him. From the Greek side, the Patriarch of Constantinople and the Byzantine emperor (who both attended) were prompted toward this effort in part by the imminent threat of conquest at the hands of the Turks. They hoped that one result of ecclesiastical reunion with the West would be much-needed military assistance from the West. The Council of Florence was ultimately unsuccessful in achieving the general union between East and West that its participants had hoped to see. This failure was due largely to the fact that the agreement that was reached on papal authority strongly reflected the Roman viewpoint, and was unacceptable to the majority of Orthodox Christians. Many of the Orthodox were also unwilling to acknowledge the Filioque teaching in any form, and repudiated the concessions that had been made by the Greeks at Florence. Still, at least from a Lutheran perspective, Chemnitzs endorsement of the councils settlement of the Filioque controversy is theologically and ecumenically significant. The Ukrainians also requested, and were granted, the right to retain their own Eastern-Rite Liturgies, ceremonies, and rites. This would, and still does, include the continuing use of the Greek version of the Nicene Creed.43 Chemnitz certainly would have disapproved of the Union of Brest as a whole, since it involved the Ukrainians submission to papal authority and their acceptance of the Tridentine theological system. However, he would probably have been very sympathetic to the Florentine approach of the Union of Brest on the specific question of the procession of the Holy Spirit, and on the question of which version of the Creed would be used by the Ukrainian Catholics. It is true that the Latin version of the Creed was never approved by an ecumenical council.46 Nevertheless, it has been given formal symbolical status within the Lutheran Church through its incorporation in the Book of Concord. And according to the Confessional Principle of our church, which must not be sacrificed on the altar of modern ecumenism, this has as much standing among us as a doctrinal decree of an ecumenical council. 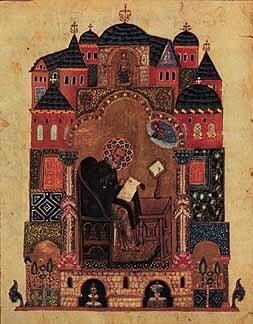 However, also on the basis of what we have seen in the writings of Chemnitz and Andreae, and from the perspective of the Confessional Lutheran theology that they represent, it is the judgment of the present writer that a Lutheran church which might emerge from, or take root in, the Byzantine Christian tradition, need not be required to start using the Latin version of the Creed in place of the traditional Greek version, if the members of that church are accustomed to the Greek version. The chief concern would be whether or not such a group has come to agree with the Biblical and Confessional teaching that the Holy Spirit is, from all eternity, the Spirit of the Son as well as the Spirit of the Father, and whether or not it has come to agree with the theological point that the Filioque addition was intended to make, even if it would prefer to use different terms to make that point. The Latin version of the Creed is present in the Book of Concord as a Scripturally-based doctrinal standard for the church, in which certain ancient heresies are clearly and solidly refuted.47 Its presence in the Book of Concord is not a liturgical rubric, implying that this version of this Creed must be chanted or recited in Lutheran worship services.48 If Greek-Rite Lutherans are in doctrinal agreement with the Lutheran Confessions, and in doctrinal unity with Confessional Lutheranism, then there should be no objection if they wish to continue to use the more ancient, and to them the more familiar, version of the Creed in their Liturgy. The members of such a church would not be removing the Filioque clause from the Nicene Creed, but in Christian freedom they would simply be declining to insert the Filioque clause. This is not merely a theoretical discussion. The Ukrainian Evangelical Church of the Augsburg Confession was organized in 1926 in the Galicia region of Ukraine, which was at that time under the government of Poland.49 These Ukrainian Lutherans, with roots in the Greek Catholic Church and in the Eastern Orthodox Church, were Byzantine-Rite Lutherans who used in their worship services a Lutheran revision of the Divine Liturgy of St. John Chrysostom. The version of the Nicene Creed that they employed was the Greek version, without the Filioque addition. In their liturgical use of the Greek version of the Creed the Ukrainian Lutherans were not in any way renouncing or rejecting the teaching of the Book of Concord on the procession of the Holy Spirit. But they were, in a sense, re-connecting with an ancient and orthodox theological tradition that would be well represented by such notable churchmen as Epiphanius of Salamis and Cyril of Alexandria. Those Greek Fathers did not reject the doctrinal point that the Latin Fathers were making in their Filioque teaching, and they in fact made the same point themselves in their own writings. But in making this point they used terms and concepts that were more natural to their own linguistic and theological context than the Latin term and concept would have been. They and their theological tradition should not be faulted for this. In conclusion, let us never forget that when we consider and discuss such sublime questions regarding the Holy Trinity, we are, more than at any other time, treading on the holy ground of Gods unfathomable mysteries. We therefore should always do so humbly, circumspectly, and prayerfully. 1. A Lutheran-Orthodox Common Statement on Faith in the Holy Trinity, paragraph 9. 2. A Lutheran-Orthodox Common Statement on Faith in the Holy Trinity, paragraph 10. 4. Willard D. Allbeck, Studies in the Lutheran Confessions (Revised Edition) (Philadelphia: Fortress Press, 1968), p. 30. 5. The Book of Concord, translated and edited by Theodore G. Tappert (Philadelphia: Fortress Press, 1959), pp. 18-19. The Filioque teaching is also expressed in the Athanasian Creed (22, Tappert, p. 20), in the Smalcald Articles (I, Tappert, p. 291), and in the Formula of Concord (Solid Declaration VIII:73, Tappert, p. 605). 6. J. L. Neve, Introduction to The Symbolical Books of the Lutheran Church (Second Revised Edition) (Columbus, Ohio: Lutheran Book Concern, 1926), p. 70. 7. Lars P. Qualben, A History of the Christian Church (Revised and enlarged) (New York: Thomas Nelson and Sons, 1936), p. 149. See also Henry R. Percival, Historical Excursus on the Introduction Into the Creed of the Words And the Son, in A Select Library of Nicene and Post-Nicene Fathers of the Christian Church, Second Series (edited by Philip Schaff and Henry Wace), Vol. XIV (Grand Rapids, Michigan: Wm. B. Eerdmans Publishing Company, 1983), pp. 165-69. 8. Andreae was a co-author of the Formula of Concord. 9. George Mastrantonis, Augsburg and Constantinople (Brookline, Massachusetts: Holy Cross Orthodox Press, 1982), p. 235. 11. Chemnitz was a co-author of the Formula of Concord. 12. Gregory of Nazianzus, Oration on the Holy Lights (Oration XXXIV), 12. 13. Martin Chemnitz, Loci Theologici (Saint Louis: Concordia Publishing House, 1989), Vol. I, p. 143. 15. Against Heresies, 3:1; quoted in Mastrantonis, p. 120. 16. Homily Against Sabellians; quoted in Mastrantonis, p. 229. 21. Ware, pp. 210-11. We do not agree with Wares generally negative evaluation of the settlement of the Filioque controversy that was reached at the Council of Florence, or with his conclusion that it represented a significant departure from the basic ideas of Augustines Trinitarian theology. 24. Martin Luther, Treatise on the Last Words of David, Luthers Works (American Edition), Vol. 15 (Saint Louis: Concordia Publishing House, 1972), pp. 309-10. 25. Mastrantonis, pp. 232-33. The Augustine reference is to On the Trinity, 15:45. 27. Augustine, On the Trinity, Book V, 14:15, pp. 94 and 95. 28. Athanasian Creed, 24-25, Tappert, p. 20. 29. Ware, pp. 203-04. For a detailed discussion of the Photian Schism, and of the factors that led up to it, see Aidan Nichols, Rome and the Eastern Churches (Collegeville, Minnesota: The Liturgical Press, 1992), pp. 105-218. 30. Quoted in John Meyendorff, Byzantine Theology (New York: Fordham University Press, 1979), p. 92. 31. See Walter F. Adeney, The Greek and Eastern Churches (New York: Charles Scribners Sons, 1908), pp. 237-41; see also Philip Schaff, History of the Christian Church (New York: Charles Scribners Sons, 1910), Vol. IV, pp. 476-89. For an excellent discussion of the theological, linguistic, and ecclesiastical issues that have played a role in the Filioque controversy, see Nichols, pp. 218-28. 33. We do know that at least Chemnitz was familiar with Theophylacts writings on the subject. See Chemnitz, Vol. I, p. 143. 38. Chemnitz, Vol. I, p. 143. 39. Philip Schaff, History of the Christian Church, Vol. VI, p. 182. See also Meyendorff, p. 110. 40. Schaff, Vol. VI, p. 182. Several of the Greek signatories at Florence did later repudiate their endorsement of Laetentur caeli. 41. Schaff, Vol. VI, p. 182. 43. In the most recent published edition of the Divine Liturgy, as authorized for use in the Greek Catholic Church of Ukraine, the text of the Nicene Creed includes the Filioque clause only in parentheses. Its liturgical use is therefore seen as permissible, but not obligatory. 44. John C. Lawrenz and Glen L. Thompson, History of the Ancient and Medieval Church (1997), p. 107. 46. According to its own criteria, the Roman Catholic Church does, of course, consider the Council of Florence, which endorsed the Filioque addition to the Nicene Creed, to be an ecumenical council. 47. Formula of Concord, Solid Declaration, Rule and Norm: 4, Tappert, p. 504. 49. This church body ceased to exist on the territory of Ukraine, at the institutional level, when Galicia was occupied and then annexed by the Soviet Union at the end of the Second World War. It was reorganized in 1994, after the collapse of the Soviet Union, as the Ukrainian Lutheran Church. 50. Collect for Trinity Sunday, Evangelical Lutheran Hymnary (Saint Louis: MorningStar Music Publishers, Inc., 1996), p. 157. This essay was published in Logia, Vol. VIII, No. 4 (Reformation 1999), pp. 45-52. The printed version of the essay differs slightly from the online version that appears here.